Under Construction! Feel to look over what is here, but there is more to come! Mount Flume is the southern most peak along Franconia Ridge. There are are several routes to the peak. The Flume Slide Trail branches off of the Liberty Springs Trail and ascends a steep, wet slide. The slide is not recommended for descent. Ths is a challenging trail that reaches the Osseo Trail-Franconia Ridge Trail junction about .1 miles from the summit of Mt. Flume. This trail is most often used in a loop along with the Franconia Ridge Trail to Mount Liberty, then descend by the Liberty Springs Trail. Some hikers do an "out and back" when hiking Flume. Follow the Liberty Springs Trail to the Franconia Ridge Trail. 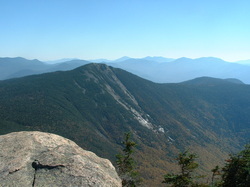 The Franconia Ridge Trail then goes over the summits of Liberty and Flume. Then you turn around and go out the way you came in. The Osseo Trail leads from the Lincoln Woods Trail, about 1.4 miles from the parking lot, the Osseo Trail the ascends to the summit of Mount Flume.